Did Someone Move Your Cheese? 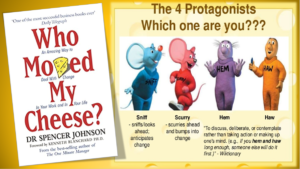 Recently a client passed a book on to me titled “Who Moved My Cheese.” The book is all about A-mazing ways to deal with change in your life and work. We’d shared some of the personal and professional changes we’ve had recently and he thought the book and its lessons would be of value. People rarely share books anymore so I took the share seriously and read the book cover to cover… Then I read it again! Any Engineer or owner/managers of a business is well acquainted with the pace of change… that pace only seems to accelerate every year. Getting comfortable with the speed of change is hard to do and a required skill. 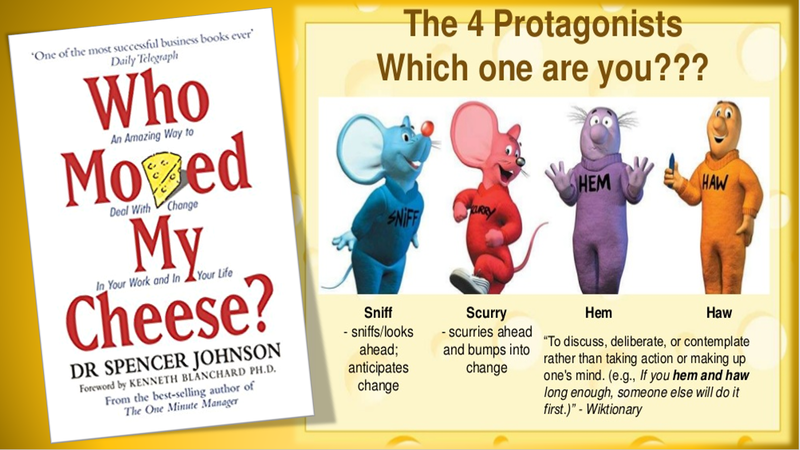 The book talks about 4 mice who saw the source of their food drying up and how 2 of the mice accepted that and changed while the other 2 mice refused to accept that things had changed. The book shows what happens to each of them. The book uses a maze to illustrate how we all have to navigate change. In talking to many of the people we serve I hear how much their position and responsibilities have changed over the time and how that has impacted their life. Most of us can relate. For me much of the change comes down to how VSG does what we do and being adaptable to the new opportunities we are offered. Each of us will have opportunities that came disguised as work and very often accepting these opportunities will mean the difference between success and failure. We are the Visual Solution Group. We help you create communication and we get your point across clearly and concisely. We can also help with banners, graphics, apparel, printing and most anything else related to communication. Call us at 916-225-6931 or visit us at www.visualsolutiongroup.com We get your point across! As youngsters we learned every action had a potential opposite reaction. Personally I taught my daughters to consider the impact of their actions on others. This applies to many areas of life. Things like hold doors open for people, don’t litter, look your best at all times and don’t dispose of things in a careless manner. One of the basic areas of this comes down to where some of us throw trash. When I go to athletic events I often see beer cups thrown into urinals. Who could possibly think this is either a good or even appropriate place to throw trash? Someone has to remove that from the urinal and dispose of it properly. 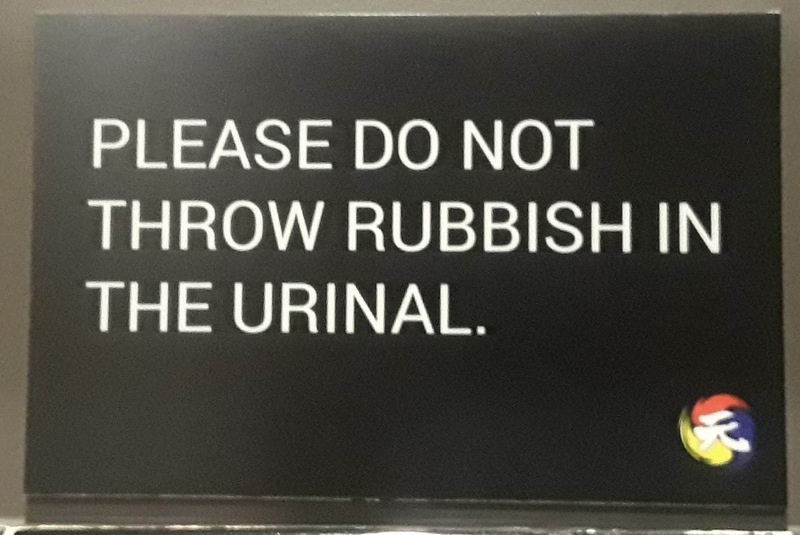 Was the person who threw it there actually taught that a urinal was the proper place to throw this away? Other than the fact someone has to remove this and throw it away what are the other potential impacts of this behavior? I asked an Engineer about the impact of small pieces of trash in a urinal they explained when small bits of trash collect in filters and enough debris collects in one of these filters a spill is the result. If the debris gets past the filter there is potential damage to the plumbing system and that results in increased labor, material, down time and costs for everyone. The down time resulting from this results in a closed restroom and this impacts us all… Especially the elderly and infirmed. At the end of the day the sign is asking that we all consider the other person and act accordingly. Simple message and a great result! When I decided I wanted to work for myself and serve the public I thought I knew what to expect. So far it’s been more interesting and at times even more exciting than I had reason to believe it would or could be. These days when I’m asked “Can You Do That?” my initial reaction is to say “Yes” and then figure it out. The best hotels in the world pride themselves on their ability to say yes and figure the rest out from there. This story is about starting with “Yes” and going to the next step. 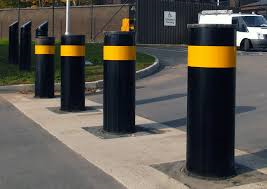 In the last few months we’ve been asked to help with installing bollards, speed bumps, chain link fencing and even an 8’ high iron fence. We’ve never proactively told anyone we do these things… they tell us they need help, ask for that help and we’re programmed to figure out how to help. A long time ago I learned my life would be easier if I knew people who could get things done. It turns out I know people who can do each of these things and many of my customers need help from time to time. Sometimes I get calls from an Engineer who has an issue in front of them they need solved immediately. I’ve always promised when it’s a sign issue just call VSG, tell us what you want and consider it’s complete. I love telling someone who is frantically looking for a solution “I Got This” and then handle it. I was given a problem recently with a sign that was an important part of a safety system. The sign was damaged beyond repair and with inspectors coming in within the following week it needed to be dealt with. I was called on a Saturday morning and an hour later I met with the engineer, understood what was needed to solve the issue and by 5:30 Monday evening the situation was dealt with. I love being that company for so many of you. Thank you for letting it be VSG! Done at the right time and in the right situation a simple play on words can be extremely powerful and drive the exact behavior you are looking to drive. 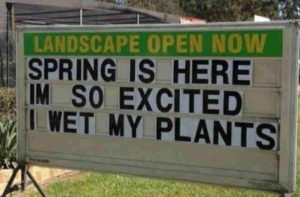 With the advent of spring I have a picture from a nursery reminding you that spring is here. You may need to water your plants as a result and that the landscape department is open for business. There is actually a lot going on here. The most important takeaway from this sign is what’s called a pattern interrupt. It should be “Wet Your Pants” and with the simple addition of the letter “L” the entire meaning has changed. Changing the meaning in both a subtle and dramatic way causes the brain to work and respond in a much different manner. This is much like what happens when you re-arrange words. “The Dog Bit Johnny” use the same words and “Johnny Bit The Dog”. We are using the same words and have a very different meaning and causing the brain to reconsider the entire premise. Using technology like this is clearly not a great fit for every project or in every setting. The reality is we place visual communication in an effort to garner attention. Consider this… We’ve all seen “No Parking” signs and recently I saw a sign that said “Don’t Even Think About Parking Here!” Both say No Parking and one is overly demanding and I would imagine much more effective! We are the Visual Solution Group. We help you create communication, we get your point across clearly and concisely and we help you solve problems you didn’t even know you had! We can also help with banners, graphics, apparel, printing and most anything else related to communication. Call us at 916-225-6931 or visit us at www.visualsolutiongroup.com We get your point across! The famous football coach Vince Lombardi loved to take his players back to the basics after any loss. He started every post loss practice with the phrase “Gentlemen, this is a football.” His thought was that managing the most basic element of what you were responsible for made you better than most everyone else. Today I want to review what a sign is. The word sign comes from the 13th century and means gesture or motion of the hand, especially one meant to communicate something. 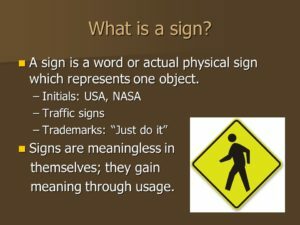 The term comes from the Latin word signum “identifying mark, token, indication, symbol, proof, military standard, ensign, a signal, an omen, SIGN in the heavens or constellation. Keep in mind this is from the 13th century and the term is still being used in its same basic form today! This is where the idea of Visual Communication originated. When the term was initially agreed on the language the world used was very different and much less developed than it is today. With language being more developed today we have far more ways to confuse the most basic level of communication. Scholars say that the English language is one of the more difficult languages to learn due to multiple meanings for the same sounding word. There, their and they’re are excellent examples of that difficulty. When spoken they can be confusing and they get more clear when written if the reader is paying attention, understands the difference and isn’t engaged on social media. I mention social media due to what has become acceptable spelling and syntax errors. 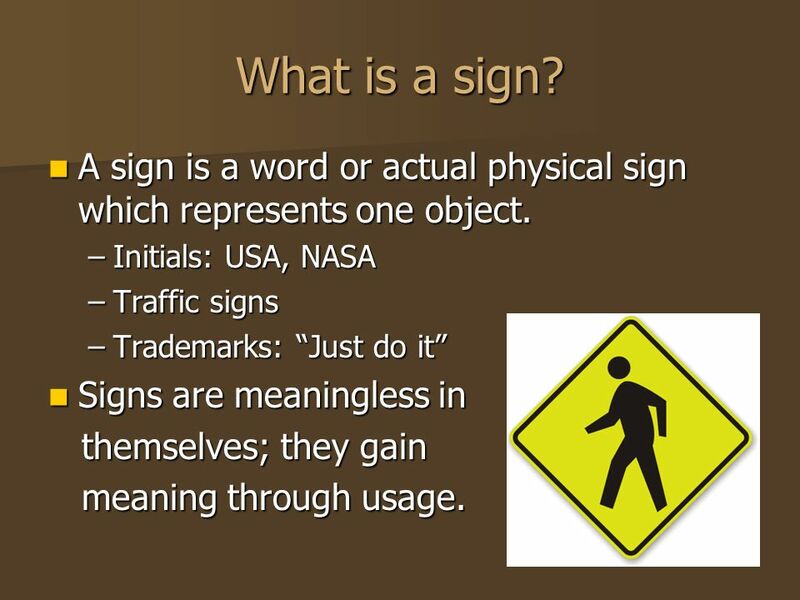 Some of the errors redefine what a sign is and must be taken into account when a sign is designed. There was an incident over the weekend where someone wanted to take a selfie with a caged Jaguar. This was a black Jaguar and not the car kind… The wild animal kind. There were signs and warnings and gates and fences and none of them worked to prevent entry. This person made a decision and was able to ignore each of the posted signs and get around each barrier and get back to where the animal was residing and then took the selfie. The animal had other ideas and reacted as you would expect a predator to react. When this person got close enough to the fence the animal was able to grab their jacket and get a claw on them. The result was minimally damaging to the person… they were injured and they survived. 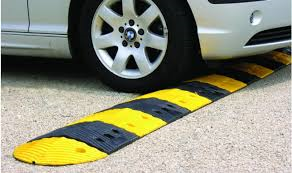 None of the signs or physical barriers were able to prevent a highly motivated person from entering anyway. The fact is the signs and barriers work for almost everyone else. This true story tells us we need to communicate in different ways for different needs. 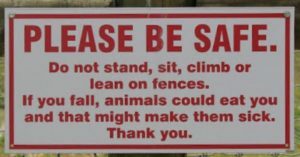 The sign I have listed here might work for docile animals and wouldn’t be the best choice for Jaguars or any of the other aggressive and dangerous animals. Knowing that you would communicate in a different manner. The Federal Government uses a physical color coded system to convey a threat and areas where there are X-Rays present use a different system. The method of explaining danger has to fit the danger. Signs and intent matters. As we drive down the road we’re accustomed to seeing signs for fast food, gas stations and even points of interest. Actually, when it comes to points of interest you need to pay really close attention or you’re likely to miss a point of interest as these are disappearing from road side signs. Some of my personal favorite activities when driving involve looking at bumper stickers and then I compare and contrast the occupant with the sticker. Just doing the comparison can be worth the price of admission! You might have a sticker on the window or bumper of your car telling the world about your child getting on to the Honor Roll or the fact that they were the Student Of The Month at their school. I’ve attached one of my personal favorites when it comes to the message the driver wants to send. I spotted this on the back of an SUV in Mid Town Sacramento and it tells a rich and complete story about the driver. Vietnam Veteran, Member of the Infantry, Member of the Airborne and you also know they Proudly Served. There is a lot of communication on one window of one SUV. If you were going to use the Bumper Sticker method of communication how would you go about doing it? Single sticker with a single message or would you go the multi message route and tell as much as possible about who you are and what your interests are? I know when election time rolls around I get tired of reading the sticker and comparing and contrasting! How about you? If You Have A Child This Is Exceptional! 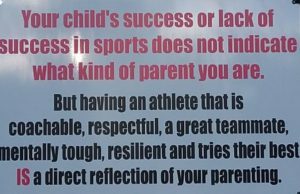 Many of us with children do whatever possible to encourage our children to become involved in some form of extra-curricular activity. For some children it’s dance, playing an instrument or scouting and for many other children it comes down to being involved in a team sport. Something like soccer, baseball, softball or football to name a few. One of the purposes of sports is to teach how to win and lose with grace. Often times it’s harder to learn to win with grace than it is to learn to lose with grace. 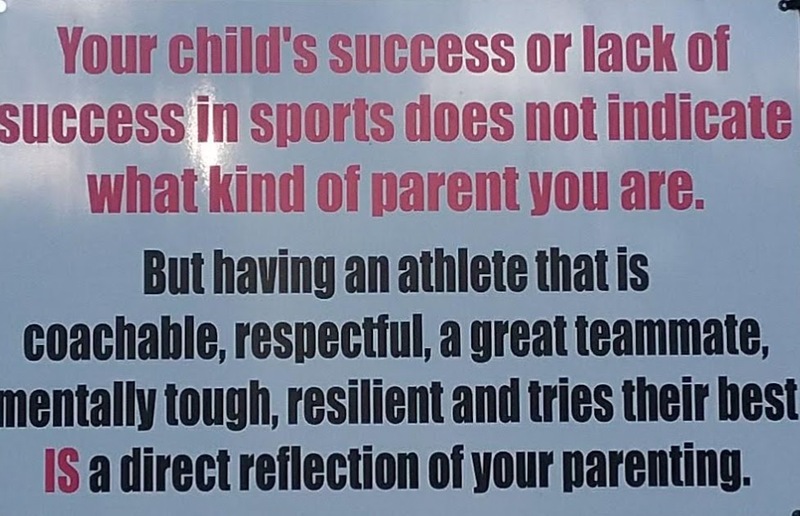 We’ve all been exposed to a child who isn’t coachable, won’t listen to anyone and at the end of the game or season was just impossible to get along with. Most of us blame the child and ignore where the child learned the behavior. I saw this sign at a baseball diamond recently and I found it to be a great subliminal representation of what we all either want or say we want. The child may not be well equipped for a promising future playing for the Giants or the Dodgers and that’s not really anyone’s fault. No one blames the child or the parent. However when I see the child I referenced above I do look at the parent and wonder what happened. Parenting is extremely hard work and its very important work. Raising a child who will lead, will accept criticism and learn from mistakes is something to aspire to in my opinion. This sign was one of the best examples of that goal I’ve ever seen. This is a sign that made me stop what I was doing and consider how I’ve done as a parent. It turns out I did a pretty good job! We’ve all heard you can get too much of a good thing. I have proof! I’m a lover of signs for many reasons and not the least of which is their ability to define what behavior is acceptable and what behavior is off limits. Much of this comes down to making things more understandable in terms like enter, closed, no parking and no trespassing. What does it look like when signs run amok? Stop and read each individual sign and comply. 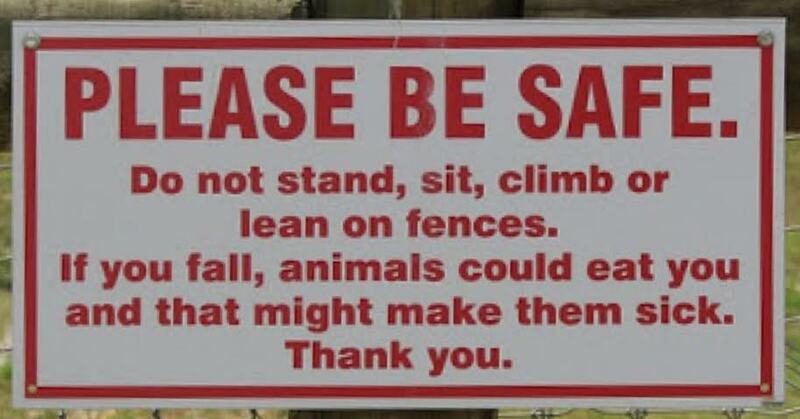 Park then return and read each individual sign and comply. Quickly glance at this group of signs and see if one sticks out. See the signs, ignore them due to the number and park. When faced with the sheer number of signs, the deteriorated quality of the signs and where they are placed my bet would be that most simply ignore them, park and continue with their day. I will admit my choice was #4. There are evidently a lot of rules that go along with parking here. The number of signs posted provide and demand more reading than I care to do in order to just park. Like you, I have other things to get done than to stop and read several very low quality signs and make sure I’m in compliance with what’s expected. This should be condensed into a single sign and posted somewhere other than an entry where stopping to read a sign could cause an accident. Simplify wherever possible for a better result. Oops! 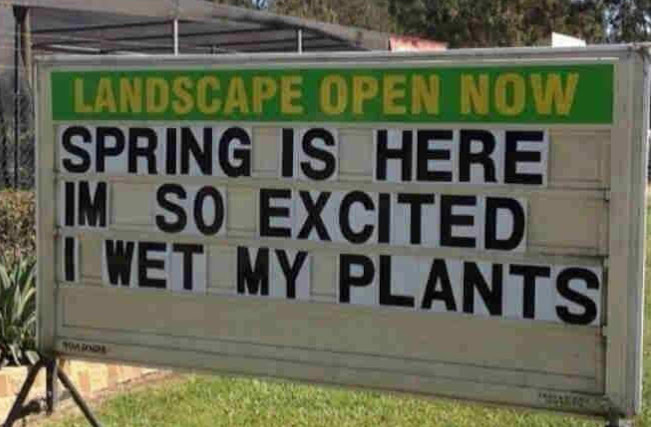 This was my thought when I rolled up on this sign the other morning. So many things were going great and one thing detracted from what was going on. There I was… on my way to see a client and I hit a traffic slowdown. No one likes to hit traffic but something good came out of it. 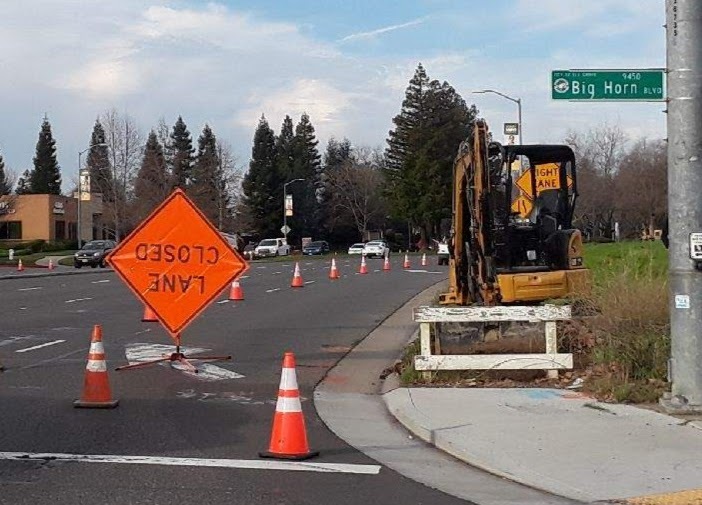 Road repair was happening in front of me and the crew from Elk Grove was seriously hard at work like I’ve seen them work in the past. They were patching potholes that morning (Who doesn’t hate potholes?) and while I was stopped I saw this sign. They were evidently so busy getting to work that sign configuration was a minimal consideration. This is a familiar story. If I was to write a story on signs that were improperly installed by others I could write for a long, long time. Signs not level, signs not actually affixed, signs placed where they increase confusion and signs placed in places they shouldn’t be placed. This sign was upside down and this happens because someone gets busy and makes a mistake. While I waited in my truck I watched people point at the sign and laugh. How much of their laughter is directed at the sign and how much at the work crew who put the sign in place? That answer is impossible to say but figures in to the entire equation. VSG installers spend a little bit more time to create a better result. We fix mistakes others have made and we dot I’s and cross T’s. If VSG was the last one there and failed to act when acting should have happened, that’s on us. Placement matters!